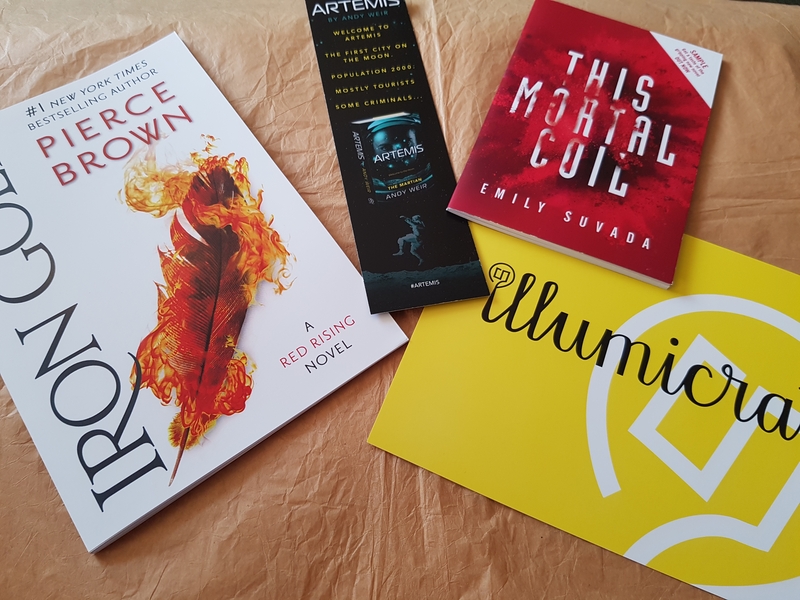 August’s Illumicrate is all about the bad guys, the villains, the anti-heroes. Kicking off the box is the book – Catwoman: Soulstealer by Sarah J. Maas. This is part of DC’s relaunch of their female heroines, following on from the Wonder Woman book last year. Without getting into all the debate around Maas and whether she’s too rude for YA, this book intrigues me. Catwoman is someone I remember from the reruns of the old 60s Batman series with Adam West, then the Dark Knight’s scene stealing Anne Hathaway version. So I’m interested to see what Maas has done with Selina Kyle. I love a canvas bag, they’re ever so useful and I have hundreds. This Villains are my Bag number from @kdpletters will be added into the mix. I’m not a HP fan so this Sirius coaster doesn’t really do it for me. I’m sure however that one of my book club will love it. @katieabey designed it exclusively for Illumicrate. Darkdawn was one of my favourite books of 2018 so far so this handy little nail file designed by @heyatlascreative is going straight into my bag. I don’t wear a lanyard to work as I work at home but if I did then I’d be upgrading to this one from @fableandblack to rep the crew from Six of Crows by Leigh Bardugo. This necklace makes me smile – we’re all the protagonists of our own stories but are we also the antagonists in someone else’s? @down_the_rabbithole allows you to play both sides. I love a good candle and this one will set the atmosphere for my next caper meeting. @elvenwickcandles has made this sparkly number which smells delicious. A mirror is a handy tool to see who’s following you when carrying out the plan and this one from @reverieandink features a quote from Holly Black. This art print card by @jamilamehio of Catwoman, Poison Ivy and Harley Quinn round off the box. There are also a few goodies from different upcoming books but sadly no bonus ARC this time. I’ve enjoyed the themed boxes we’ve had recently, it brings everything together nicely. This box has a decent mix of bits and bobs which I can see myself making use of. It’s here! 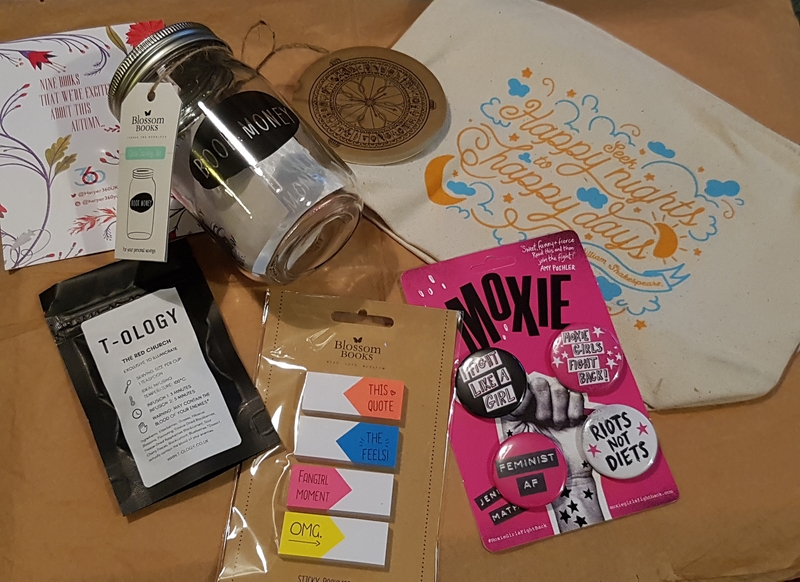 I get a bit excited by this subscription box because, well, books. They’re not only my favourite thing but Illumicrate often has special editions and exclusives long before anyone else. Artemis by Andy Weir, exclusive edition. I didn’t read The Martian (the one turned into a Matt Damon film I didn’t see either) but I have been getting a bit more into sci-fi recently and C loves it so this is definitely getting read. Bookish Tea Towel designed by @evannaveillustration exclusive to the box. I like this, it’s fun, it’s bright. It’s just a nice thing to have really. “The Right Book” print designed by @nutmegandarlo exclusive to the box. It’s well documented that I don’t like J.K. Rowling much but I do agree with this sentiment. Unicorn Journal designed by @prismofstarlings exclusive to the box. This is lovely and brings the number of 2018 diaries/journals I have up to about 5. 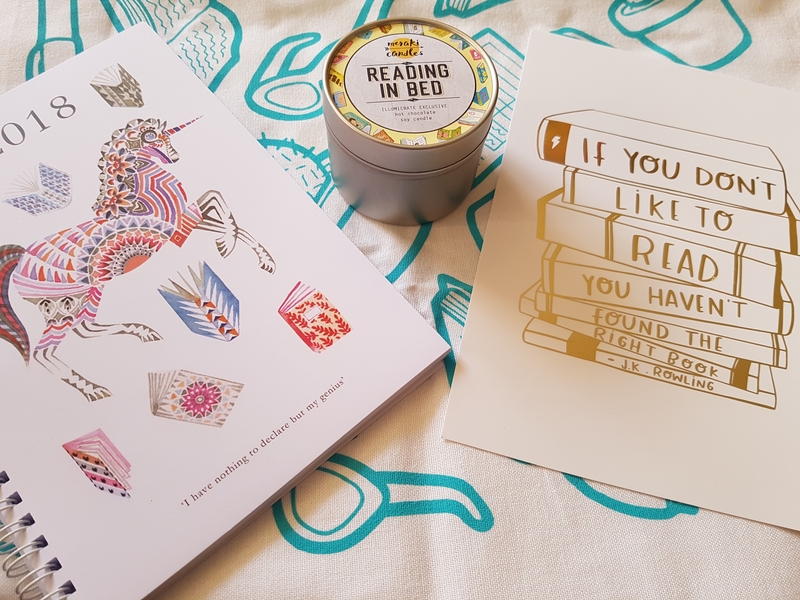 Reading in Bed candle designed by @merakicandles exclusive to the box. This smells so much like hot chocolate that I have to refrain from licking it. So good. Moon and Stars necklace designed by @ohpandaeyes exclusive to the box. Such a cute necklace that pairs excellently with Artemis. This is an excellent box and one I am happy to spend my money on. 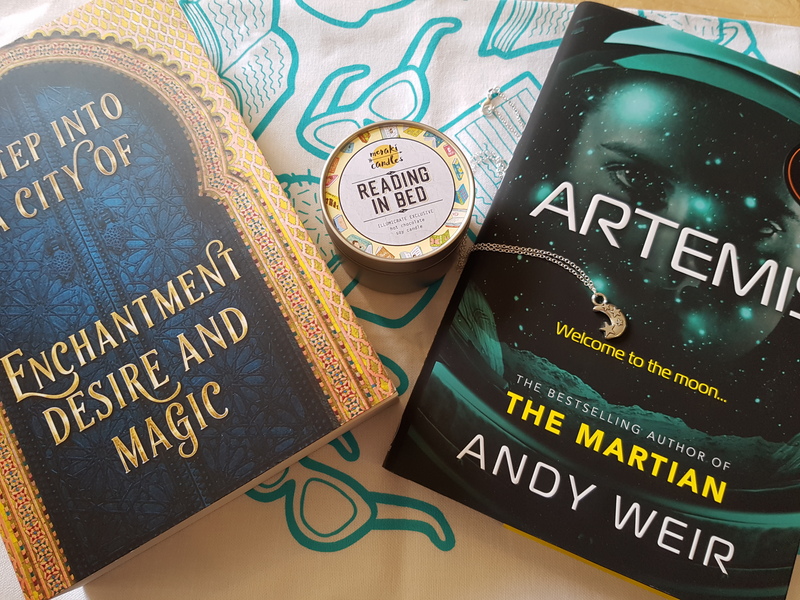 Really makes it up after a month of uninspiring beauty boxes – books ftw. This book came in my recent Illumicrate and I have to admit I was a bit apprehensive about it. I haven’t seen the Wonder Woman film for a variety of reasons. But this isn’t a novelization of the film or really part of that narrative. Bardugo wrote some of my favourite recent fantasy books (The Grisha trilogy, Six of Crows, Crooked Kingdom), which meant I knew she could write but working with existing characters is not always a good idea (see some of the many recent continuation novels from Sophie Hannah, Anthony Horowitz etc, a rather uneven territory). However I was pleasantly surprised by her treatment of the DC super hero. Starting on the secret island Wonder Woman hails from, the novel really gets going once she leaves Themyscria for our modern world. Having saved Alia from a sinking ship and broken one of the laws of the Amazons, Diana must leave or face banishment. An ancient bloodline is also in play – and the end of the world could be nigh. In the end I read this very quickly, it certainly made my commute fly by, and it was really enjoyable. 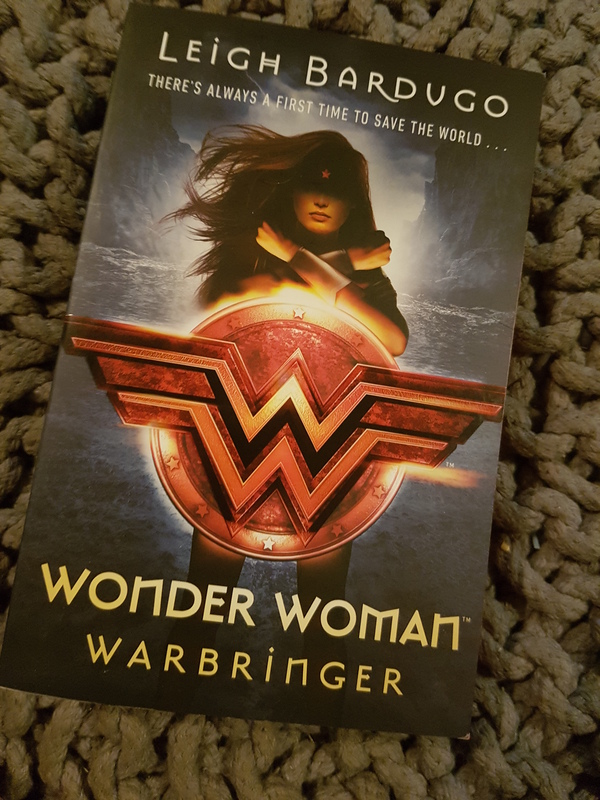 I hope this isn’t the one off it seems, Bardugo is a great writer and I really like the voice she gives to Wonder Woman. Have you read this book? Seen the film? Have anything you want to share? The comments section is waiting for you. Woohoo! 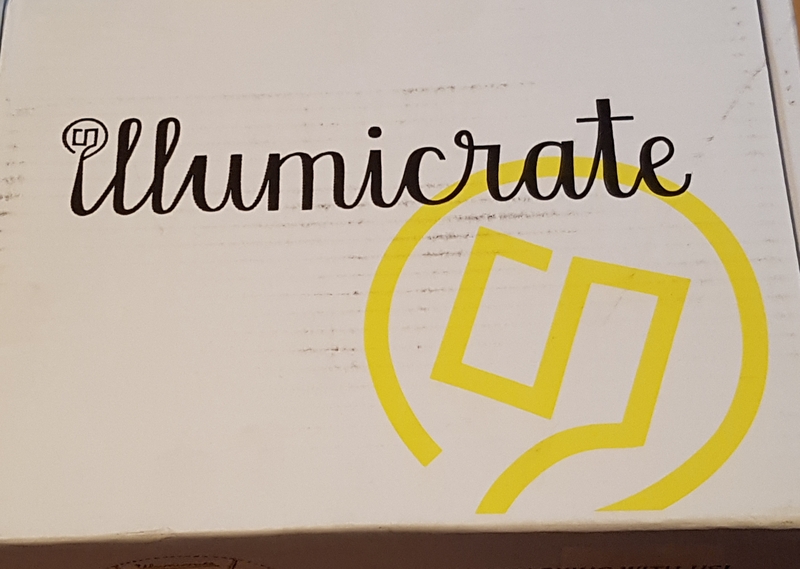 Illumicrate is here. So many great bookish items and so many exclusive treats. There are so many good things in this box. I am almost too excited to know where to start! 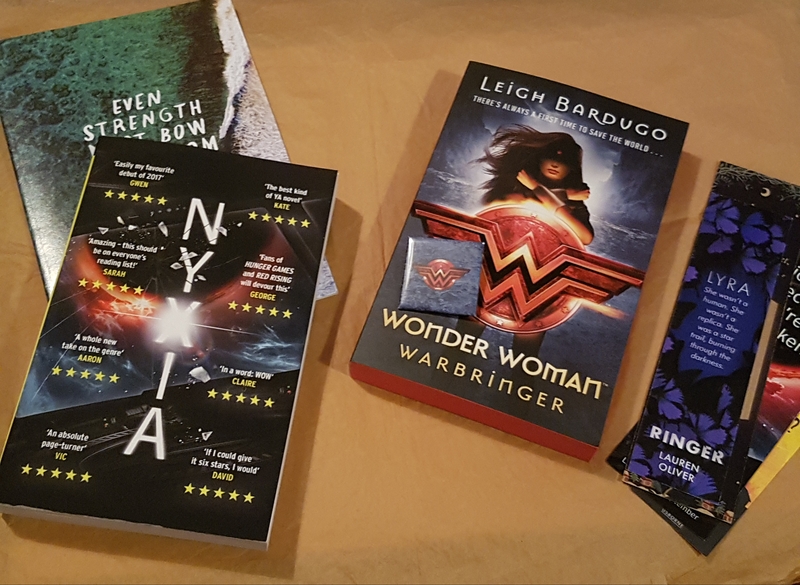 The book is Leigh Bardugo’s Wonder Woman: Warbringer which is published soon and will be reviewed once I’ve read it. 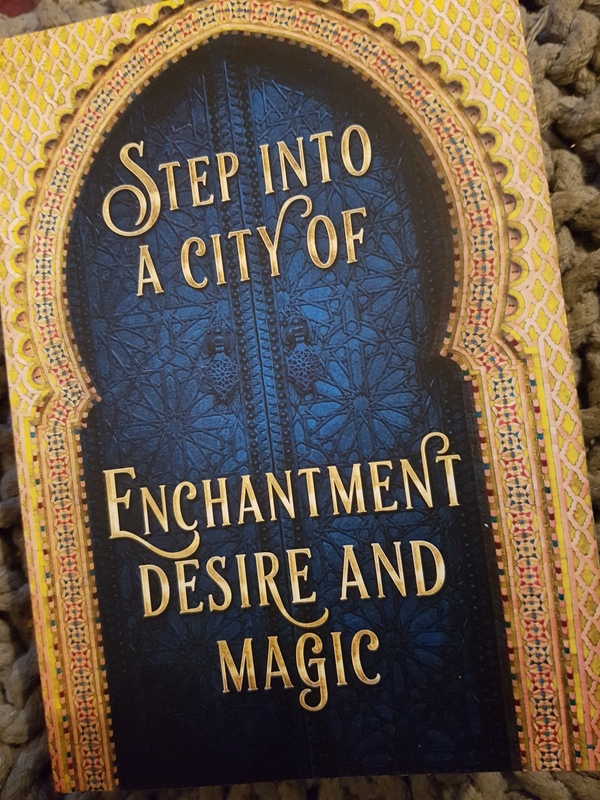 This is such a great book and Bardugo is one of my favourite writers. There’s also a super cool enamel badge which will go nicely with my Wonder Woman Converses. Wisdom Journal from Hey Atlas Creative – it’s dot to dot so perfect for doodling. ARC of Nyxia by Scott Reintgen – another interesting looking advanced reader copy – review to follow. The Red Church Tea (may contain the blood of your enemies) from T-ology. Shakespeare canvas pouch from Miss Phi. Extras; Ringer, After the Fire, Harper 360, The Bear and the Nightingale, Moxie. I genuinely can’t pick a favourite item so I will just be here reading and patting my lovely new book things….